#SnowInKenya ; Snow In Kenya than before, Snowballs on the streets of Nyahururu, Kenya, as Kenyans dubbed it "New Boston". - Bana Kenya News, Real African Network Tubanane. Home featured World #SnowInKenya ; Snow In Kenya than before, Snowballs on the streets of Nyahururu, Kenya, as Kenyans dubbed it "New Boston". 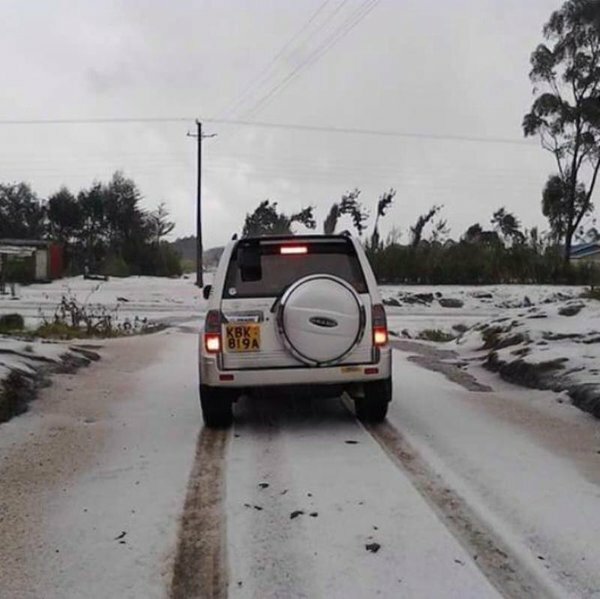 #SnowInKenya ; Snow In Kenya than before, Snowballs on the streets of Nyahururu, Kenya, as Kenyans dubbed it "New Boston". People today experiences snowballs in Nyahururu, Kenya. The snow and extremely cooler temperatures were last experience in 2008 in some parts of Rift Valley. It was also experienced in some parts of Nairobi. The month of June and July is always the cold months in Kenya. In most parts of the country, the temperatures do not go beyond 20 degrees Celsius. Here is a new "Boston" like Kenya in Nyahururu and how people feeling it now.